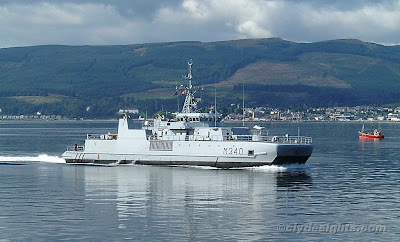 Commissioned into the Royal Norwegian Navy in 1994, OKSØY was a minehunter built to a new catamaran design, the first ship in a class of four vessels, which were later joined by another five similar craft built as minesweepers. Built by Kvaerner Mandal, the 55.2 metre long OKSØY and her sisters are surface effect craft, with twin fibreglass hulls and a kevlar skirt fitted either end between them, which when air is blown into the enclosed space, results in a draft of less than one metre. Waterjet propulsion was driven by twin MTU diesel engines, giving a speed in excess of 20 knots. OKSØY suffered damage when she ran aground in 2005, and is currently awaiting disposal.